If you are done with Vagator, Anjuna, Candolim and its likes, then we have found the perfect stay for you in Mandrem. Wooden cottages, hammocks, a party venue and more are on offer at this resort that is also open through the year. During the off-season, Mandrem tends to totally shut down. So if you are looking to enjoy the stormy sea or sunny days with chill vibes, then the Mandrem Village Resort should be on your next Goa booking list. Located right by the beach, with the beautiful Mandrem creek and beach for company, this resort will have you truly feeling the ‘goa vibe’. Not to mention, the resort's also got surf coaches and a beautiful spa. Thankfully, all of their wooden cottages are air-conditioned. And did we mention that all the bathrooms have showers looking up to the sky? Some cottages that are larger and suite-like, in fact, have their own private garden too. 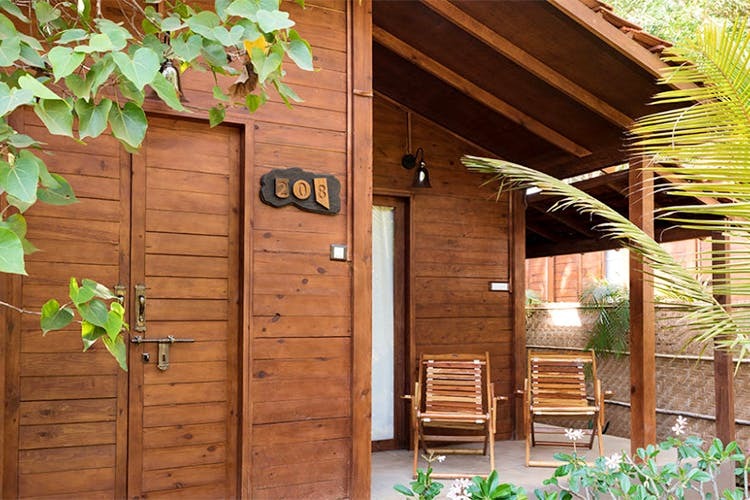 Their regular cottages start from INR 4,500 a night (for lean season but can go up to 10-15k plus when the demand's high) and offer open lawns and an amazing beach view. Start your day with goodies from their in-house bakery and call it a day at their open deck restaurant, Terra and Mare with Italian food and fine wine. And in between, right after a swim, when you long for cold sangrias, let no one stop you from heading to No Filter. Because holidays, are for binges minus the guilt. Right opposite the resort is Lamuella boutique-meets-cafe in case you seek some feel-good shopping and coffee.